So I loved the mincemeat recipe I tried. Mainly because it's delicious but also because it makes large batches. One of my cooking mottos: Make it once; use it often. Big eaters live at my house! The tarts I baked were great, but very fiddly what with cutting out rounds, stuffing them in mini tart pans and cutting out star toppings to boot. 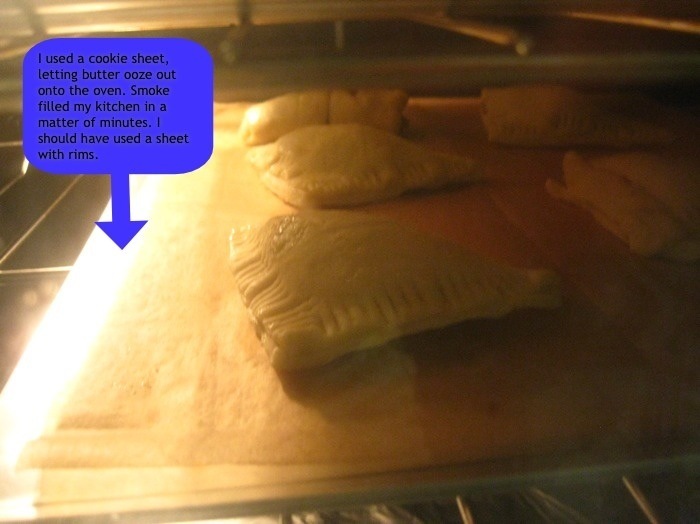 So that made me think about turnovers: what could be easier than spooning filling on buttery flaky dough? It would be super easy if I used store-bought, but nope, I've always wanted to make puff pastry. I did some searching, and found quick puff pastry over at Not Without Salt. With this recipe, instead of a full day of work, you get flaky buttery goodness in just a few hours. 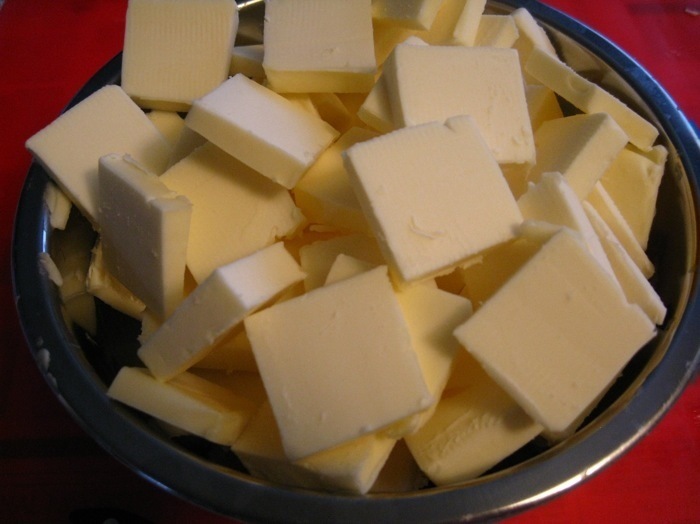 First, you start with the butter -- lots and lots of butter. Sorry I don't have pictures of turning the dough, but I can't seem to have a clean hand free when I'm rolling out. For a step-by-step, check out the Not Without Salt post. 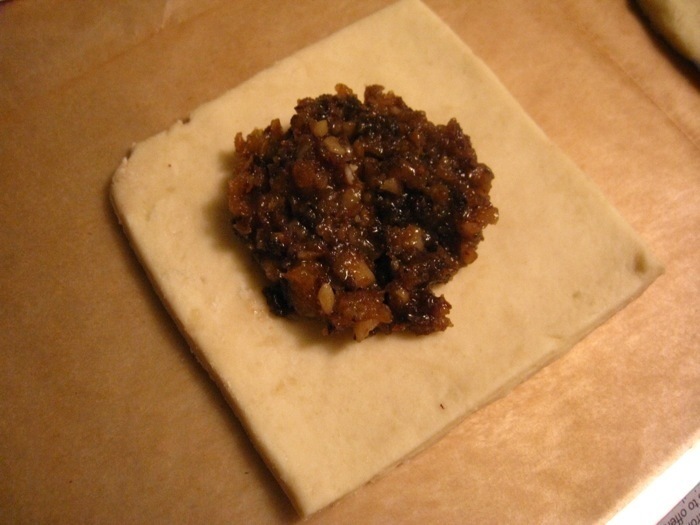 But here's my mincemeat filling on a puff square. Lovely! And then a kitchen mishap: I used a cookie sheet instead of a rimmed baking sheet. Butter started leaking from the dough and onto the bottom of my stove. In a matter of minutes, my kitchen filled with smoke. I pulled them out and into the toaster oven to finish while I mopped up the stove. I'm not sure why so much butter pooled under each turnover. 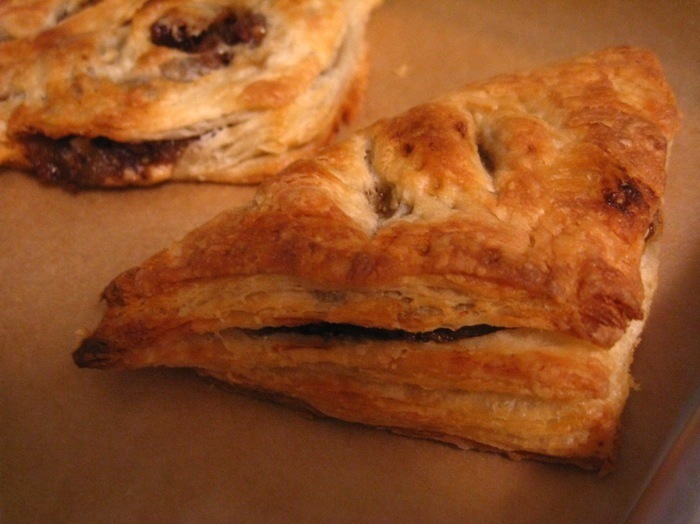 Despite the smoke, the turnovers turned out great. This won't deter me from trying again and solving the mystery of butter pools. Any tips for how to avoid them next time?